Tag sales. Computer help. Painting services. Effective immediately, those signs — and all those others crowding town-owned roads, traffic islands and rights-of-way — will be removed. That’s the promise of the Planning and Zoning Department, according to a press release sent earlier today. It reiterates regulations that have been in place since at least 2002. Temporary signs advertising charitable events may be placed on town property. They require approval by the chief of police, P&Z director and Parks and Recreation director (or their “designated representatives”). Qualifying organizations (“i.e., local non-profits”) must fill out a request form — including proposed locations. There’s a maximum of 15 signs for each event. They can’t be placed more than 2 weeks before the event, and must be removed within 2 days. Maximum size is 2 feet by 3 feet. In addition, signs cannot be placed on school property without permission of the superintendent’s office; or “within the interior of Compo Beach or Longshore”; or on Town Hall property, trees or utility poles, or in any way that interferes with traffic visibility. 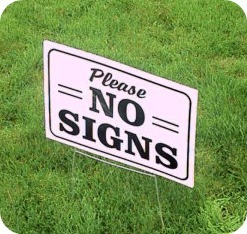 Signs on private property require owner’s approval. It is “suggested” that they be removed within 2 days after the publicized event or election. The town does not control — and is not responsible for — signs on state property. Town guidelines say, “It is not advisable” to place signs on property, rights of way and islands on Route 1, 136, 57, 33 and the Sherwood Island Connector, or the I-95 and Merritt Parkway ramps. All that info was announced today. Let’s see how much better the town looks tomorrow. This entry was posted in Politics, Westport life and tagged political signs, traffic islands. Bookmark the permalink. Do you know if this applies to retailer’s sandwich boards, etc? There are sign regulations in place that allow certain free standing signs for retail. Typcical. The politicians get to keep their signs but control everyone else. Why doesn’t one ever see signs for sign companies? Besides the signs, how about all the big trucks in the roads right now ripping up everything. Who do we contact about all the road construction and roads blocked by big trucks in Westport with no police in site to direct traffic or them. Can we assume this applies to people running for P&Z and ZBA positions, too? They seem to forget these regulations when running for office. If political signs are allowed on public property as an expression of free speech, then why are the signs opposing the Aquarion behemoths down? Those are clearly political signs. The P&Z suddenly produces a new regulation which is curiously lame against the stated problem of “Tag sales. Computer help. Painting services” signs. But it just so happens that the regulation will disproportionately affect a community organization protesting the P&Z decision to allow a company under investigation for a $3.6 billion fraud to change it’s business from local to regional at the expense of the town. Al G and I have provided this sign removal enforcement for the past 6 years removing 100s illegal signs monthly at no cost to the town and we apply the regs fairly to all that follow the regs and get permits (which are no cost). And should we are told to stop, no problem, we will cease and fade away unlike the mounds of illegal signs placed weekly around town. Kudos for the work and hassle of removing the signs! However, surely you must recognize that is not a long term nor systematic solution for you to personally pay to clean up someone else’s mess. These are not new regulations. They are many years old! Got it. The article makes it seem like a new P&Z regulation. This is a ridiculous waste of time and effort, everything in this town is complicated. Who cares about a few signs in certain spots, really? Is there a link to this “press release”? In quotes, Dan, because I didn’t see it. I checked the link, and it was last revised February 2015, and is not a new release, as implied. As for Facebook, I don’t use it (except for family stuff) and didn’t realize it has become the new way to inform citizens of regulatory matters. I’ll check it out. Maybe a new way to vent? Two points: First, for many private, for profit events, there are probably private property owners supportive of those events who will make their properties available for a sign. Second, I had once asked if I, as a citizen, was permitted to remove “illegal” signage. I recall that I was told that I did not have a legal right to do that. I support Al and Chip, both members of the P&Z Commission, and regret the negative political type comments that were directed at Chip Stephens by some members of the public.. Interesting and quite amusing timing for this new enforcement indeed @Chip Stevens! 2 days before a meeting with PURA and Aquarion to discuss a P+Z decision that hundreds of Westport residents are questioning and want to see discussed publicly you are PERSONALLY taking down signs that invite Westport residents to show up for this hearing and voice their concerns. While it might be your preference to not talk about the P+Z approval – the most important infrastructure project for this town and the entire region that will last 100 years! – a group of concerned residents decided that this gigantic project was worth asking questions. And by asking questions and reading thousands of pages of documents we found out that the 1) the water is not only for Westport but for surrounding areas 2) water pressure problems will not be solved 3) there are actually water safety concerns storing this much water 4) there are alternative sites in town that can be completely hidden! 5) trees will never shield the project approved by you ! Well, we’ll keep asking questions and will keep talking to people – with or without signs. Thanks Dan Woog for keeping this discussion alive and public! (and yes, the rules were always in place, we took down signs for a Westport Middle school theatre play 1 day after the play). Also: From what I’m reading you can’t take down signs on private properties. #freespeech! The sign reg. enforcement is not new. P&Z has always had a sign regulation in place which we update as needed. Chip StePHens and Al Gratrix have been enforcing our sign regulations for the past 8 years and have earned kudos from most people in town. Prior to a de signer run, our police department is brought into the loop. The disappearance of the illegal signs placed on Longshore property were actually taken down by someone other than Chip and Al. As all politicians in Westport know, our maintenance crews and one sign hating member of the public are the “culprits”. These signs were found mashed up and laying on the grouind with the metal wickets remaining. The metal wickets then become projectiles when the mowing crews hit them. Regarding the Chamber event signs-Al and Chip picked up 5 remaining Dog Fair signs yesterday. They picked up numerous signs on North Avenue advertising long completed events. In the case of the Library signs, someone had stapled their personal tag sale signs over the Book Sale signs. BTW- the Aquarion signs at Cross Highway remain. To those who must continually bash, know your facts. To Chip and Al, the majority of the town will continue to thank you for a job well done. Would you explain what the enforcement practice has been and what are the exact rules for the removal and by whom? 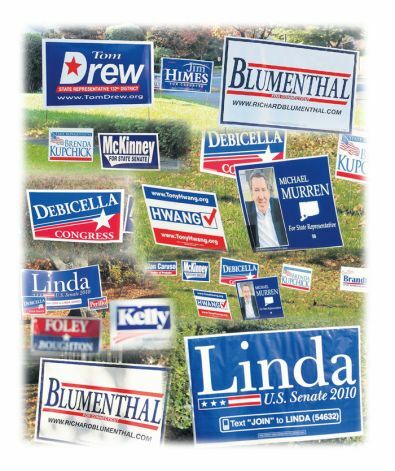 Is it by self-appointed volunteers or is there a qualifier as to who can take down the signs? How consistent has this practice been? I’m in the middle of work but will take a second to give the short answer. The enforcement of our sign regs is a function of the P&Z staff . The P&Z commissioners also have the authority granted by the State to perform enforcement duties. In my 9 years on the commission the enforcement has been fairly consistent. The press release that started this discussion did a good job of defining where and when signs can be posted. If a person who does not have enforcement powers is caught, they could be prosecuted and fined. It has happened. The person I referred to in my original post, has been removing political signs in front of Longshore for years-it’s their private covert operation. The town and the state also remove signs in their right of ways for grass cutting. Any sign in a sight line will be removed because they are safety hazards. I can’t argue with you about wanting to de clutter the streets, I hate signs everywhere. While I have no issue with the removal of for profit signs, this is harmful to all the non profits of the town who use this cost effective way to promote events that are the fabric of our town. This will hurt their fundraising activities and the overall the vibrancy of each of these events. Instead of this draconian act, without notice, regardless of existing regulations, there should have been conversation. 15 signs just does not cut it and outlining where they will be placed is burdensome and absurd. The Chamber uses signs… so does, Wakeman Town Farm, The Library, DMA, Clasp Homes, Earthplace, the Y, Homes with Hope and many many more. This hurts all of them. Is this really what we want to be doing? You know the regs as well as anyone. Are you now saying they apply to everyone except for you and those causes you favor? Your Dog Fair sign on Winslow park was an eyesore, in my opinion, and you had it up there for at least a month. I head up the Regulation Subcommittee and will address the issue of sign size, quantities allowed per event, placement and enforcement in our next subcommittee. Our NEXT sign reg meeting will be in August when the commission is in recess. Now before the bashing starts, rest assured that once we finish in subcommittee, we then go to public hearings after September. The public is encouraged to participate in our subcommittees where the format is less formal than Thursday nights. We do want to hear from you. Look for the notice on the Town Website or sign up to receive our notices on your email. …is this going to be on the test?